Armed disturbances in Benghazi protesting the arrest of ICC-wanted Mahmoud Warfali (Photo: Social media). There were reports of armed riots and military clashes in Benghazi yesterday between supporters of Saiqa Special Forces member Mahmoud Warfali and forces representing the authorities. The clashes followed rumours that Warfali had been killed after handing himself in for investigation. These reports were denied, but disturbances seemed to have continued nevertheless. However, it seems the so-called clashes were in reality more a show of strength and protest by his armed supporters. 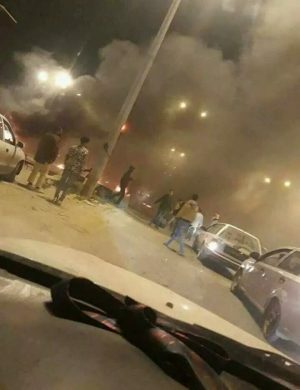 Many roads were closed in Benghazi and most the firing of arms were directed in the air, it seems, with no concrete reports of deaths or injuries. Warfali, wanted by the ICC for possible crimes against humanity/war crimes, had handed himself in yesterday to the Military Police division of the Hafter-led LNA. Warfali had appeared in a number of photo/video clips that had surfaced to be carrying out summary executions against prisoners accused of being extremists/terrorists. Subsequently, Warfali appeared on Libyan TV sitting in an office with a Military Police officer confirming to his supporters he was alive and in good health. He appealed for calm from his supporters. Latest reports say that Warfali has been released from the Military Police base in Marj and has returned to Benghazi after the completion of investigations.